Suffolk County Police Maine Bureau officers rescued three kayakers who could not get back to shore in Fort Salonga today. Photo by: Eduardo Jr. Solana, via Free Images. Northport, NY - July 7, 2015 - Suffolk County Police Marine Bureau officers rescued three kayakers who could not get back to shore in Fort Salonga today. Michael Fisher, 16, his brother Matthew Fisher, 20, and Kevin Nobs, 16, all of East Northport, launched their kayaks from Crab Meadow Beach at approximately 1:30 p.m. 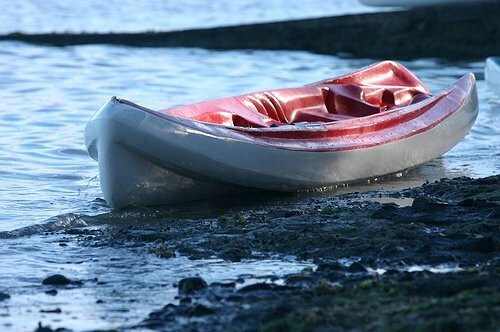 While they were kayaking, the wind picked up taking the trio into the Long Island Sound, approximately 1 ½ miles from shore and they could no longer paddle back. Nobs’ kayak overturned while Matthew Fisher jumped out of his kayak and attempted to swim to shore. Michael Fisher called 911. The three kayakers, who were wearing floatation devices, became separated. As the males were struggling, two lifeguards at Crab Meadow Beach went on their long boards toward the victims. The lifeguards and Police Officers Paul Carnival and Keith Walters who were on Marine Bravo, rescued the kayakers. The lifeguards were transported back ot dock, they did not require rescue. Subject: LongIsland.com - Your Name sent you Article details of "Three Kayakers of East Northport Rescued from Long Island Sound"